Emigration and immigration; Economic aspects; Congresses. This volume is the first in a new Springer series to examine one of humanityâs most pressing concerns: global migration and its implications for development. As population mobility grows in an ever more crowded world, the Global Forum on Migration and Development (GFMD) has emerged as the most important global mechanism to deal with the urgent challenges it presents. This book explores fresh strategies proposed by the GFMD in its fourth year of operation in Mexico and beyond. Interrogating the relationship between migration and development, the papers advance the Global Forumâs aims of reducing poverty and empowering low-income families everywhere. In 2010, there were 214 million international migrants worldwide, nearly two and a half times the number in 1965. By 2050, international migration is likely to expand sharply in scale, reach and complexity, due to growing demographic disparities, environmental change, shifting global political and economic dynamics, technological innovations and social networks. Migration can bring substantial gains to families in less-developed countries, and mobile labor is an axiomatic feature of the global economy. Yet outward migration of skilled workers can seriously retard development at home, and exert pressure on wages in host nations. Balancing these and other conflicting concerns requires the substantive and expert discourse offered in this book. Contributors discuss, and propose concrete solutions to, vital issues such as the debilitating costs of cross-border labor recruitment and the provision of social and income protection for foreign contract workers. With suggestions on how to facilitate connections between transnational families, and gender- and family-sensitive immigration regimes, this book aims to foster collaborative intergovernmental links as well as partnerships between governments, civil society and international organizations. It shows how the GFMD can positively influence policy and institutional behavior while addressing wider systemic factors in protecting mobile workers. About: This volume is the first in a new Springer series to examine one of humanity’s most pressing concerns: global migration and its implications for development. 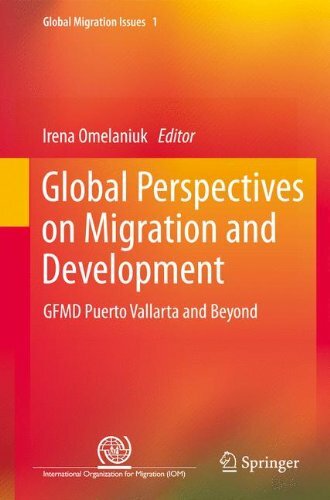 About: Examining the key findings of the 2010 Global Forum on Migration and Development (GFMD), this book probes interactions between migration and development, including irregular migration, gender, family and labor mobility between high and lower income countries.